Joe Cocker was born John Robert Cocker on 20 May, 1944, in a suburb of Sheffield, UK. Having played around the pubs of Sheffield, Cocker eventually signed with Decca and released his first single in 1964, a cover of the Beatles' "I'll Cry Instead," under the name Vance Arnold and The Avengers. It was a flop and Decca did not extend his recording contract past 1964. It was not until late 1968 that Cocker finally had recording success, which came with another Beatles' cover, "With A Little Help From My Friends." As for the original recording of "Something,"—"Why not The Beatles?" I hear you shout! 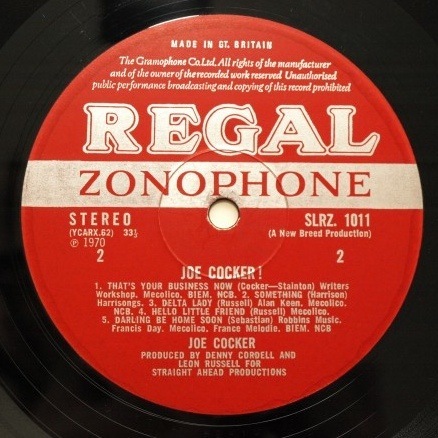 Well, Joe Cocker, the Sheffield Shrieker, recorded his version before The Beatles, though their version was released first. The Beatles started the recording process earlier than Cocker, but did not complete the track until mid August 1969. Some might argue that George Harrison, rather than either Cocker or The Beatles, should be cited as original artist. The solo demo that he made for Cocker on 26 February 1969, was released in 1996 on "Antholgy 3" but it was, of course, never intended for release, so I remain by Joe Cocker. Cocker's own version was first issued on his second LP release, "Joe Cocker!" on Regal Zonophone SRLZ 1011 (A&M in the USA). Joe Coker died on 22 December, 2014.